Additions, gratuities, itineraries and much more! A Galapagos cruise could very well be one of the most memorable times of your life. This little volcanic archipelago in the middle of nowhere has truly one-of-a-kind wildlife and an incredible history. It’s one of those rare places where you get that perfect mix of bizarre, incredible, and 100% unique. Combining an amazing place like the Galapagos Islands with a luxury cruise? It doesn’t get any better than that. The tricky part is deciding which cruise to go for. There are a lot of vessels that can take you exploring seemingly prehistoric world, all with their own pros and cons. The Endemic is a 16-passenger catamaran with two decks and 9 cabins. 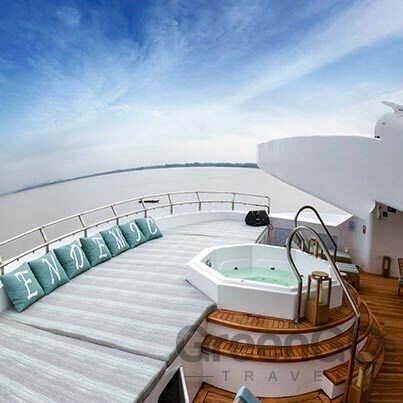 It’s got an amazing on-deck Jacuzzi and panoramic suites. There’s good reason for this being classed as a “luxury” cruise. It’s a pretty new ship, too. It was launched in the summer of 2018, and it’s received great feedback from customers. The Galapagos offers a lot of different cruises, so it’s a pretty competitive space. The ships really need to stand out to get attention. In this regard, the Endemic has totally brought its A-game. The company that owns the Endemic is actually new to the travel industry as a direct operator. Previously, they’ve been the go-to company that’s built a lot of the first-class and luxury vessels that currently cruise the Galapagos for the past 20 years. In other words, they know what goes into a great ship. After decades of analyzing their customer’s requests and results, they finally took to the water with their own vessel. Their way of phrasing it is that they’ve got “the product of 20 years of guest feedback, resulting in the mostly highly evolved Galapagos vessel to date”. Once you see it for itself, it’s hard to argue with that bold statement. Here’s where you can really see the thoughtfulness that was put into the vessel’s design. For example, a food elevator takes the food from the lower deck kitchen to the upper sundeck. They serve meals in the open (al fresco). What this means is that you can get steaming food served on the top deck that came fresh from the kitchen within seconds. Private balconies will let you enjoy the view of the volcanic islands in a way that doesn’t make you feel like a tourist; it’s just you, the ocean, and the Galapagos. They also have high bandwidth satellite internet (for an additional fee) which is basically unheard of in the Galapagos. Typically, ships will have either no internet or low bandwidth that’s spotty at best. This is a great feature for people that need to stay reliably connected while cruising. At the time of my writing this, onboard broadband costs $30/day per device, or $180/week. If you for sure need internet while cruising, though, you might want to double check for current information with the guys at GreenGo. They’ll be happy to give you the most up-to-date information. You can also hop in a totally clear two-person kayak to enjoy all the marine life right underneath you without even needing to get wet (depending on skill level). A catamaran is the perfect setup for this, since you can paddle in the shade between the hulls for the best view without the sun’s glare. It’s a really cool experience. The Endemic is probably the most stable vessel in the Galapagos. The shipbuilders made it with a unique and exclusive buoyancy system. Catamarans are already known for being the most stable on the water, and the Endemic is the best of the best. The bottom line is that the Endemic was totally purpose-built for the Galapagos. Every feature abroad it is thoughtfully created to enhance your stay, and you won’t find another ship like it in the archipelago. Since the Endemic is a new vessel, there are a lot of great opportunities to take advantage of while they build up their business. They’re really working hard to keep their customers coming. If your itinerary is 6 days or less, they’re offering one night (pre or post cruise) in a five star hotel in Quito or Guayaquil at no extra charge. If your itinerary is 8 days or more, this bumps up to 2 nights. They also have free airport shuttles to and from the hotels. Again, this is 1 ride for a 6 day or less itinerary, and 2 rides for itineraries 8 days or more. They also offer airport assistance to get on your flight to the Galapagos. This is only available to passengers that book their Galapagos flights through GreenGo and will be cruising on the Endemic. Really, though, these are all just perks. The Endemic speaks for itself; it’s an amazing vessel, and you will not be let down in any way. The cruise lengths are designed to cater to a wide audience. The shortest cruises are four days, intermediates are 5-6 days, and the full-length itineraries are 8 days long. If you really can’t get enough of the Galapagos, you can combine itineraries for extended stays. You might never want to leave. Ultimately, if you just talk to your agent at GreenGo Travel, they’ll help you plan the perfect cruise for you. If you explain your budget, expectations, concerns, etc, they’ll match you up with exactly what you’re looking for in the most accommodating way possible. That’s their job, after all. “Endemic” was an interesting choice for the name of this luxury catamaran. There are so many endemic species that are entirely exclusive to the Galapagos. This vessel is the same; you’ll get an experience like nowhere else on the planet. Catamarans are the most stable in the ocean; when you’re in the open water, there’s the potential for things to occasionally get a little rougher. With this style of vessel, you’ll be as steady as you can be. It’s also pretty well brand new. Most of the Galapagos ships are well maintained, but the Endemic still practically has that “new catamaran smell”. Really, the pictures should tell you everything you need to know. Imagine enjoying a steaming gourmet meal from the top deck, watching the sun descending down behind a volcano on the ocean. Or grab a drink and enjoy it from the Jacuzzi. 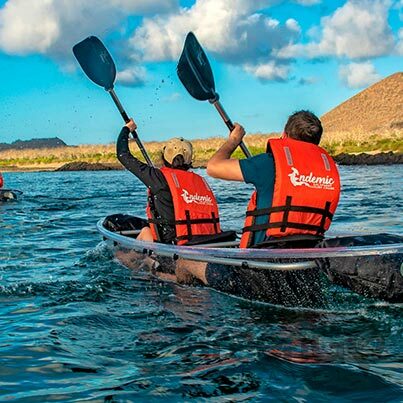 Or hop in a clear two-person kayak and watch the marine iguanas swim. Either way, it’s hard to beat. 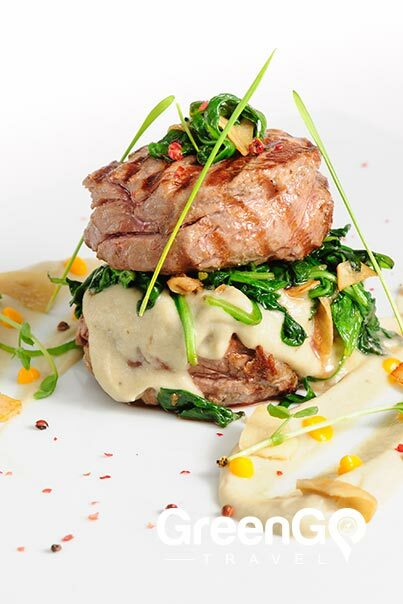 The reason to go with the Endemic is that it’s the best of the best. The Endemic sets the standard for modern luxury ships in the Galapagos. There is not a more thoughtfully built vessel in this part of the ocean. If you want the ultimate tour of the islands, this is the one to pick. Here’s a link to the official Endemic page in GreenGo Travel Site, so you can see it all for yourself. If you thought this article is worth looking at, pin a few of our photos so other people can take a look for themselves!